Travel on the fast KTM (Electric Train Services) ETS Bukit Mertajam to KL Sentral Railway Station in Kuala Lumpur is the quickest way to get to the capital with both ETS Gold and the faster (less stops) ETS Platinum Services on this route. Train numbers starting with an EP are ETS Platinum Services. The train from Bukit Mertajam to Kuala Lumpur travels a short distance down the branch line to join the main South - North railway line to KL. Platinum services are the fastest way to travel, as they stop at fewer stations along the route. Please Note : from the 19th May 2016 there are no longer any Intercity Express Trains on this route as they have now all been cancelled. Tickets for the ETS services to KL Sentral vary depending on the type (and speed) of the service you choose. Adult Fare 58 MYR - Child Fare 33 MYR. You can buy your train tickets from BM to KL at any KTMB ticket counter at any main railway station in Malaysia. KTM Berhad train tickets are usually available to buy 60 days in advance of the departure date (but booking periods do vary throughout the year) and can fill up quickly during the weekends and busy holiday periods. We recommend you always make an advance booking to avoid disappointment. 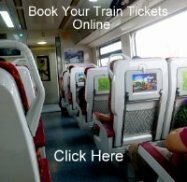 You can also, much more easily, book your tickets online.